A homemade barbecue sauce makes this easy slow-cooked shredded chicken flavorful and juicy. This pulled chicken is a fantastic alternative to more traditional barbecue dishes, and it is just as delicious, if not more. If you choose to make the dish with all chicken breasts, it will be lighter, but it won't be as tender and juicy. The addition of chicken thighs with the chicken breasts keeps the barbecue moist, and it's still relatively light when compared to pulled pork or shredded beef. Plus, the chicken thighs offer more flavor than chicken breasts. For a spicier barbecue sauce, add more cayenne pepper. 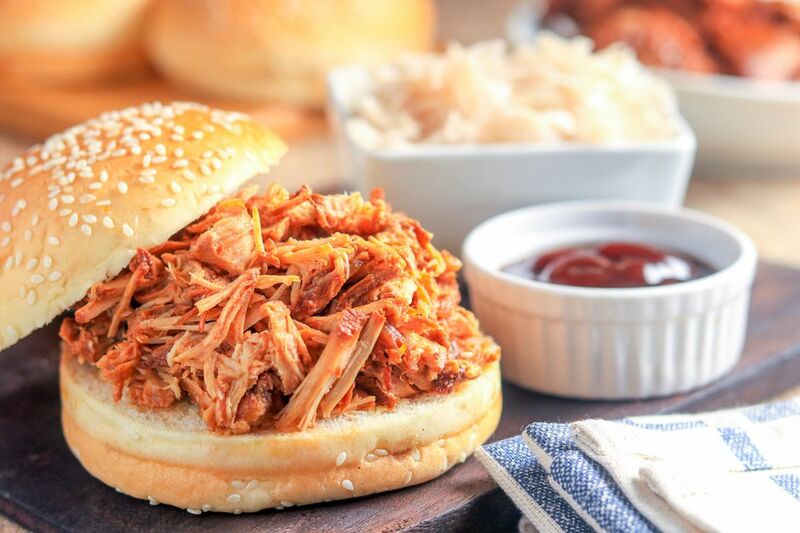 If you don't have a lot of extra time, make the pulled chicken with 2 cups of your favorite purchased barbecue sauce and jazz it up with some cayenne pepper and brown sugar or apricot preserves. Peel the onion and chop finely. Mince the garlic. Melt the butter in a medium saucepan over medium heat. Add the chopped onions to the pan and cook until they are softened and lightly browned, about 6 to 10 minutes. Stir the onions frequently to keep them from scorching. Add the minced garlic and cook for about 1 minute longer, stirring constantly. Add the ketchup, apricot preserves, vinegar, Worcestershire sauce, liquid smoke, molasses, allspice, black pepper, and cayenne pepper to the onion and garlic. Bring to a simmer and cook for 5 minutes longer. Measure 1 1/2 cups of the sauce mixture and pour it into the crockery insert of the slow cooker. Reserve the remaining sauce; put it in a container and refrigerate until serving time. Add the chicken pieces to the slow cooker. Cover and cook on LOW for 4 1/2 to 5 hours, or until the chicken is very tender and shreds easily. Using a fork, shred the chicken pieces. Serve the pulled chicken on split toasted buns with coleslaw and the extra barbecue sauce. Enjoy!